Do your employees say one thing and do another? Appear enthusiastic and willing but don’t achieve the expected results? Head in unanticipated directions while assuming they’re doing what you asked? As with most things that are not actively refreshed and renewed, corporate core values can erode to the point where the original intent is lost and overtaken by a new meaning masquerading as the original corporate core values. When this has happened, the challenges of corporate culture transformation become significantly magnified. How do Corporate Core Values Evolve? Many companies begin with a well-defined set of corporate core values that, in aggregate, create a very definite culture that is identifiable to its employees and creates an environment in which diversity of ideas can exist. That’s because the process for employees communicating with one another is culturally established and shared by the majority of the employee population. In corporate renewal situations, a deeply impactful but poorly understood phenomenon results from a “hidden” erosion of those corporate core values that has occurred over a number of years . In some cases, however, the value doesn’t merely erode — it morphs into something different, without apparently seeming to. We refer to this phenomenon of corporate core value devolution to the point of having “two current cultures with a single name” as Corporate Core Value Confusion. Corporate Core Values Confusion occurs when an original and laudable core value has, over time, eroded in small increments to the point where it is no longer representing the intent of the original tenet. Corporate Core Values Confusion is extremely complex to solve. Why? Because in all likelihood, employees still believe they are faithfully following the tenets of the original culture, and will not recognize that, in reality, it has shifted and is no longer what it used to be – in some cases actually serving at counter purpose to the original value. The complication of Corporate Core Values Confusion creates a significant transformational challenge because attempts at transforming only the “culture as it actually is” to the “target culture” will likely not succeed. Management must target the perception as well as the actuality in planning a transformation to a future target culture. 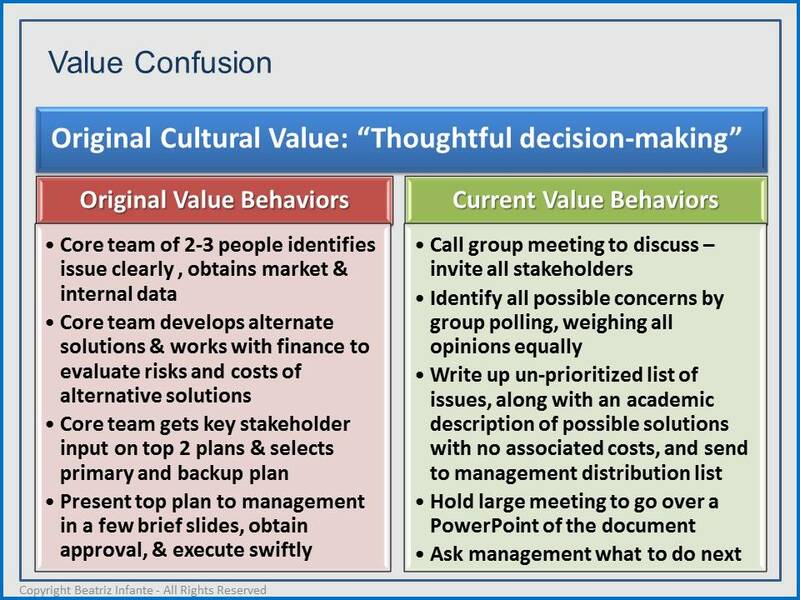 A very simplified example of Value Confusion is shown in the chart below, and highlights the challenge of this type of cultural transformation. Operationally, these two sets of cultural behaviors yield dramatically different results, but employees demonstrating both sets of behaviors will believe that they are operating under the same umbrella core value of “thoughtful decision making”. In the early days of the company, when its value system first evolved, “Thoughtful decision making” meant reaching the best decisions possible through the use of a data-driven analytical process. Implicit in that statement was that the goal was to reach a decision, while the process to get to a decision was data-driven. This core value was strongly associated with behaviors that included researching all the facts on both sides of a decision, then using fundamental engineering principles in the analysis of those facts to determine a decision outcome. The process was driven by small and empowered teams of two-to-three people who solicited broad input while maintaining ownership of the process and the decision. These small teams then presented the relevant facts, their conclusions and recommendations or plans for going forward to their management teams for approval. Upon management’s approval, the team was fully empowered to execute its decision. This culture in general led to a somewhat cautious approach to new product introductions versus the company’s competitors, but it also meant that the company avoided unsuccessful market entries, and its products, once introduced, dominated the market and typically achieved a #1 or #2 market position. Over time, however, still under the label “thoughtful decision making”, the current behaviors result in “analysis paralysis”. The original 2-3 person teams have grown to encompass representation from all stakeholders, making the teams unwieldy and unable to make decisions. Rather than a focused process to acquire the necessary data, the larger team now serves as a vehicle to bring in irrelevant objections and requests for further analysis beyond the point of reason. Rather than a small team empowered to make a decision, with clear accountability, the “large team” now has amorphous “ownership” of the decision, but no one person is empowered with the ultimate decision; anyone can say “no”, but there is little if any ability for everyone to say “yes”. As a result, decision-making at the company has slowed to unacceptable levels. Nevertheless, when pressed, every employee will point to the core value and indicate that the current process is a necessary component to supporting that core value. Implicitly the value has shifted to the process (the “thoughtful” part of the value) as the key factor that employees focus on, and the goal – the actual decision itself – has become secondary. As a result, the company has changed from one with greatly engineered products that dominated its markets, to a company that offers products meeting no particular needs introduced too late to the market, resulting in significantly decreased financial performance. 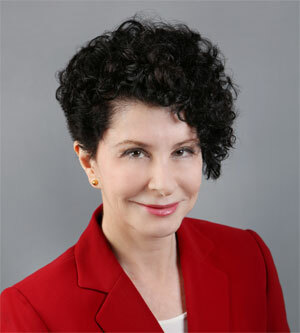 This is the classic case of Corporate Core Values Confusion – employees demonstrating the “current value behaviors” will fully believe that they are acting in the true spirit of “thoughtful decision making”, and will resist attempts to change that value, because, after all, who wants to be associated with “un-thoughtful decision making”? That is why company-specific language is critical to cultural transformations. Transformations involving Corporate Core Values Confusion are some of the most challenging and difficult to undertake, and are usually compounded by compensation and operational issues, all of which must be addressed together to achieve the desired results. When facing these strategic inflection points, seasoned management consulting professionals can make a difference between failure and success. BusinessExcelleration’s former operating executives have “been there, done that” through multiple similar situations and can bring a wealth of knowledge and experience and expertly apply it to your particular corporate transformation. Learn more about our services!